The Greenstar Si boiler series is part of a market-leading range of energy-saving condensing gas-fired boilers from Worcester. 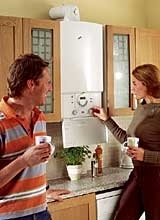 They can cut heating and hot water bills by between 15-20% - and they’re up to 30% cheaper to run than an older boiler. Greenstar condensing boilers deliver this energy-saving performance by recycling exhaust gases to extract and re-use latent heat - a highly efficient use of energy which also significantly reduces carbon dioxide in the atmosphere.